On Friday, September 7th, Juventutem Boston hosted a Votive Mass for the Forgiveness of Sins, to beg God's forgiveness for those prelates and clergy who have committed the evil acts that are now scandalizing the Church and the whole world. We also asked God to forgive our own sins, knowing that sanctity begins with each and every one of us. 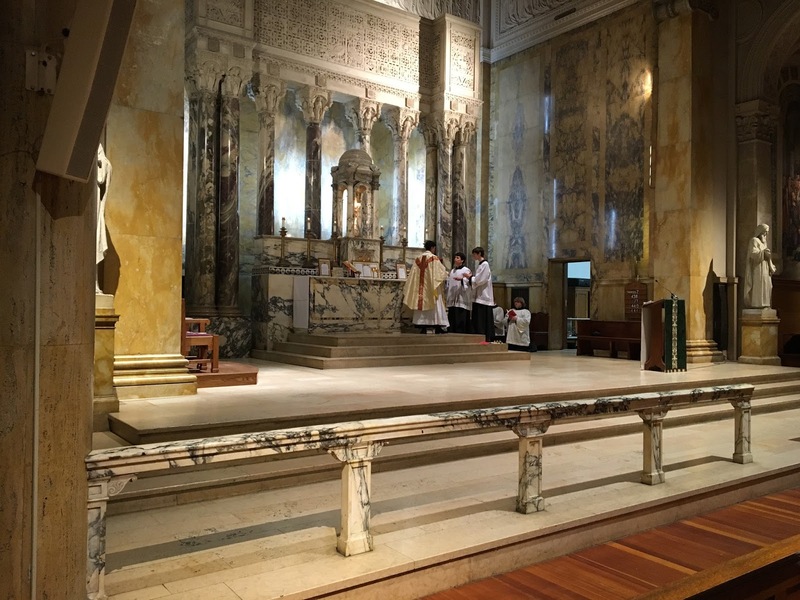 The Mass was celebrated by Fr. John Rizzo, and the preacher was our very own Fr. Kwang Lee. His homily is reproduced below. 1. My dear friends, confronted by spectacular evil in the Church (as we have seen in the news recently), we feel (acutely) the desire to "do something" . 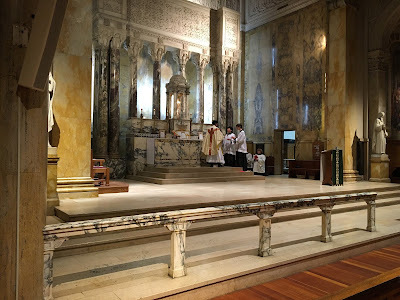 Fr Kwang Lee saying a Votive Mass for the Blessed Virgin Mary in Advent, commonly called a Rorate Caeli Mass, after the first words of the introit for the Mass: Rorate caeli desuper, et nubes pluant justum." 1. My Lord, during this Advent season, we are reminded that, just as you once came in fulfillment of all prophecies, you will come again. 2. And, so, we come to you this morning to share a few quiet moments with you—to “reorient” ourselves—, and to “make straight your way” (your path) into our own hearts. 3. 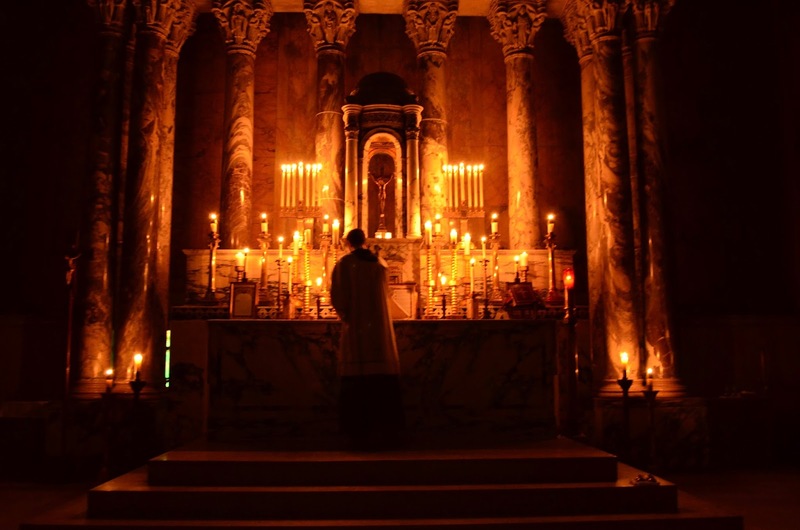 During this so-called “holiday season,” which is, for so many of us, a time of anxiety and stress, we would like to make this brief “retreat” (this brief time away) from the world (from all the noise of the shopping mall) to recollect ourselves and to discover once again joy (“gaudium”)—not “giddiness,” but that deep, quiet, inner joy which the world cannot give (is not equipped to give). 4. The world’s joy is a poor and transitory thing. It is entirely dependent upon things that we cannot control (or, upon things over which we have only minimal control): the weather, our health, our finances, other people. "From the morning watch even until night, let Israel hope in the Lord" -Psalm 129:6. 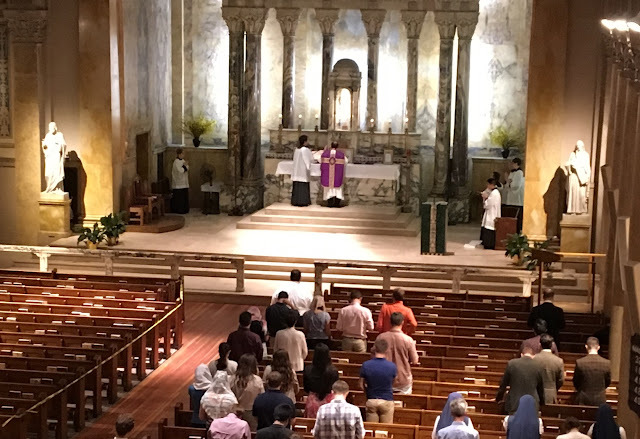 The photo is from this morning's Rorate Mass at St. Paul's in Cambridge, hosted by Juventutem Boston. Why Advent? What is the point of Advent? Most of the world, in its headlong rush towards Christmas, has no concept of this season. 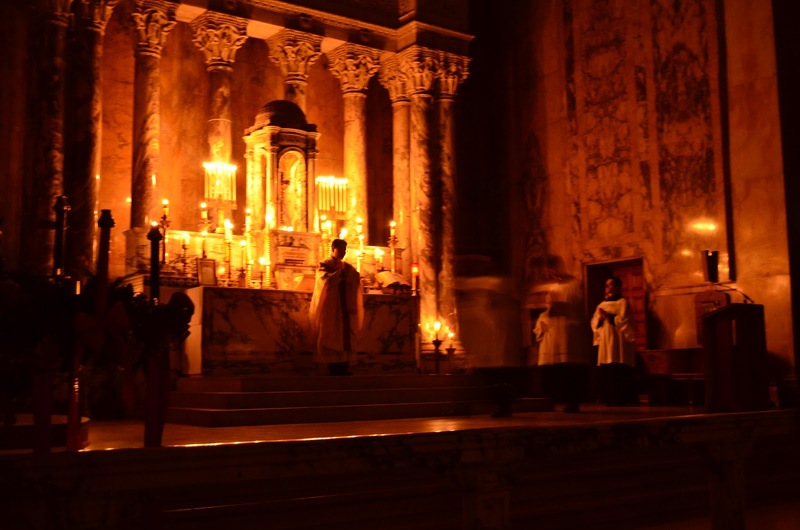 Perhaps this is because, in much of the English-speaking world at least, the culture has been shaped by Protestantism, which often has a vague sense of Christmas and Easter, but generally forgets about the rest of the liturgical calendar. We spend all of December over-buying, over-eating, over-drinking, and generally over-indulging, so come Christmas evening we are exhausted, bloated, and broke. And in all the merriment, the real meaning of Christmas is lost – a beautiful child, the hope of mankind, destined one day to die upon a cross for our sins. A day which should be so full of meaning is empty, the gap filled with kitsch and egg nog. But – thank God! – the Catholic Church has a built-in defense against this modern attack on Christmas. It is Advent! What is Advent? It is a time of preparation, in which we ready ourselves for the coming of God. How does God come to us?